There’s something funny about Mass Effect: Andromeda being “the start of something new” considering a lot of it is built on old ideas. I’m talking, of course, about the Nomad. Or, if you prefer, the Mako Pt. II. Those who played the original Mass Effect no doubt have memories of the M35 Mako, a lumbering dune buggy used to explore the (mostly empty) surface of various planets. Some of you probably have good memories. Many of you were probably less fond, considering that BioWare stripped it out of Mass Effect 2 and 3. 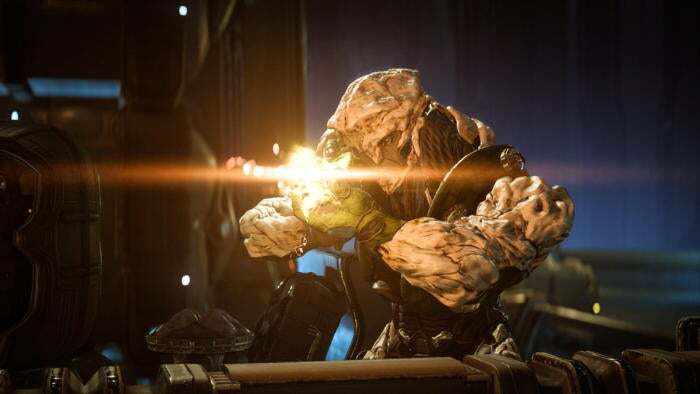 Gone was the Mako, and gone were most of Mass Effect’s traditional RPG systems, streamlined into something that was 50 percent talking, 50 percent shooting, and not much else. And people seemed fine with that. People love Mass Effect 2, right? They love 3 also, aside from the ending let-down. So it’s funny to see Mass Effect: Andromeda resurrect the Mako, now called the Nomad—a lumbering dune buggy you’ll use to explore the (mostly empty) surface of various planets. The end is the beginning is the end, as they say. We went hands-on with Andromeda for about two hours last week, and the Nomad is really the biggest change for the series. 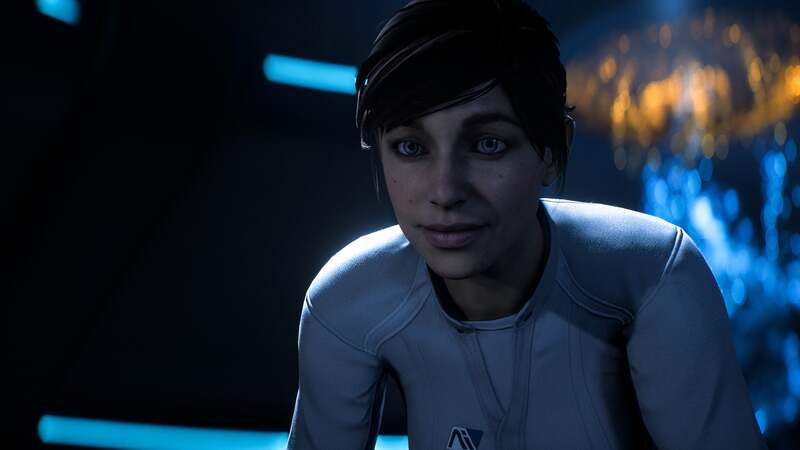 Sure, there are new characters and a whole new ship to explore—Andromeda takes place 600 years after the end of the previous game, with humanity exploring the not-so-nearby Andromeda Galaxy. 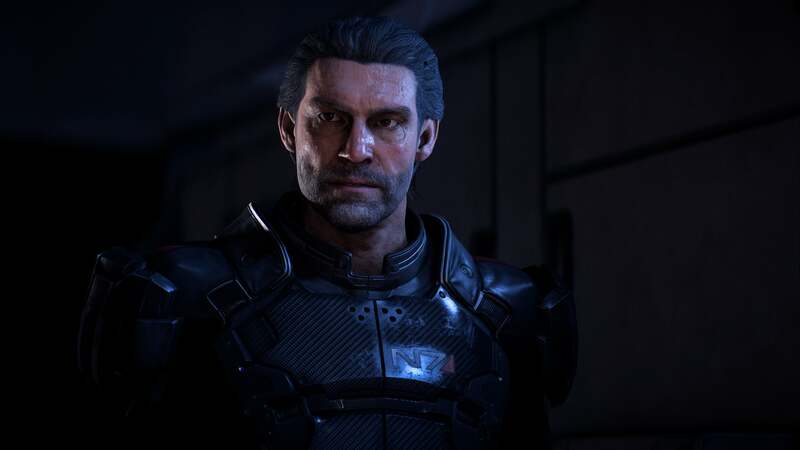 Your ship, the Tempest, set out shortly after the events of the original Mass Effect and thus has no real knowledge of the Reapers, Shepard’s fate, or anything of that sort. It’s BioWare’s method of hand-waving away the end of Mass Effect 3, making a clean break from the Shepard storyline and its ramifications. And it works fine. If Mass Effect was BioWare’s take on Star Trek, this is Star Trek: The Next Generation, or maybe Voyager given the “ship stranded far from home” setup. You play as either Scott or Sara Ryder, siblings on the Tempest. Awoken from your 600-year journey, you find the planet you were supposed to settle on has (surprise!) become uninhabitable in the interim, and you’re sent down to figure out why. And immediately, you realize Andromeda is a much different game from Mass Effect 2 and 3. Not only is the opening a really slow burn compared to the action-packed prologues of its predecessors, but the planet itself is way more open. We’re not to the Nomad sections yet, but even the straightforward “Shoot everything that moves” missions in Andromeda are a bit less straightforward than before, with multiple paths and secondary objectives and nooks to explore. You’re also a lot more mobile, courtesy of a jumpjet attached to your armor. 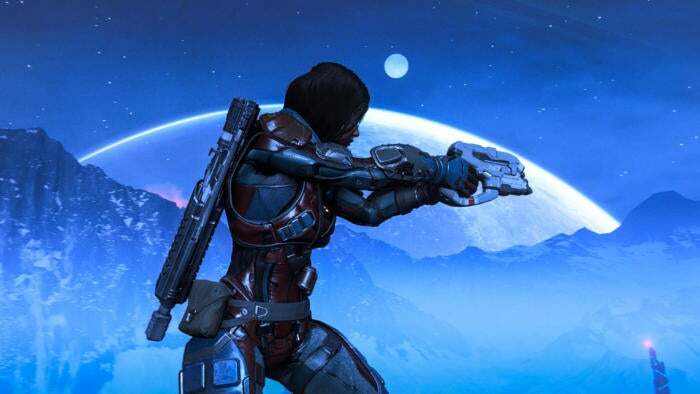 Boring ol’ Commander Shepard and crew were always two-feet firmly planted on the ground, but Andromeda has you hopping across canyons and up ledges, and even temporarily hovering in the air when you aim your weapon. Combat’s a lot faster and more fluid, instead of the Gears of War-inspired stop-and-pop of previous entries. It plays well! If nothing else, Andromeda is even more action-centric than Mass Effect 2 and 3. Like with Dragon Age: Inquisition, it feels like BioWare’s nailed down the action aspects of a modern action-RPG. The studio’s come a long way from the stilted combat in Knights of the Old Republic. Anyway, our demo was broken into two halves. The first had us run through the opening mission, which I’ve recounted above. You don’t really need to know much else—it plays like a standard Mass Effect 3 mission, running through areas and killing enemies. More polished, but basically the same. We then moved onto an exploration/dialogue-heavy section later in the game. As far as navigating the central spaceship, all I’ll say is: No elevators or load screens. It’s one big area this time, which makes things feel more natural. 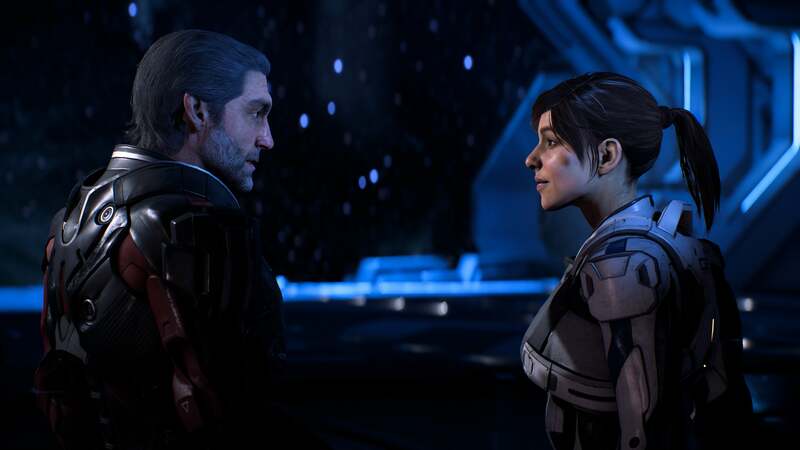 Dialogue is about what I’d expect from Mass Effect—same “cinematic” camera angles, lots of talking. The key difference is that responses are now emotion-based, separated into “Professional,” “Casual,” “Emotional,” and “Logical.” It’s a good change, with characters reacting as differently to your tone as your actions. No more “Just Pick The Paragon/Renegade Option Every Time” trap like the previous games. The Nomad, though. Let’s talk about the Nomad. My experience with the Mako Redux is limited to about 20 minutes, so I don’t want to make any hard judgments on Andromeda. But holy hell, there is a lot of empty space. It makes sense thematically, I guess. After all, these are barely populated planets in an entirely new galaxy. But I’m already wary following the MMO-lite tedium of Dragon Age: Inquisition, and after driving around in Andromeda’s bland backwater I started to have Hinterlands flashbacks. There’s a ton of stuff on the map, but none of it seemed well-contextualized or even very interesting. Enemy outposts, a bunch of “Go here and click a button”-type quests, crafting materials to pick up, and the occasional story beat. BioWare is at its best when it’s telling a story, so I can’t imagine why these games keep getting packed full of fluff. And hey, maybe my impression of Andromeda is way off. Maybe I’ll sit down and play it next month only to find planets packed full of surprises instead of fodder enemies, dotted with well-written storylines instead of fetch quests. The original Mass Effect’s Mako sections weren’t great, but at least they weren’t bloated. Maybe that’s the case here. It’s challenging to demo a 30-plus hour game for a fraction of its runtime and come away with an idea of the whole. My first impression isn’t great, though. Combat? Solid. The story stuff? A bit of a slow start, but I’m looking forward to unraveling a new galaxy. I’d just prefer to do so without an Inquisition-style grind in the way. Before we break, there’s one thing we really need to talk about: Performance. Normally I don’t cover performance in previews. Why? Because it’s pre-release code. It’s always buggy, it’s always poorly optimized, and there are always problems. Fine. Facts of life. But that’s usually because we’re six months or so out from release, and the expectation is those problems will be solved before launch. No point in talking about issues if there’s a good chance those issues are temporary. 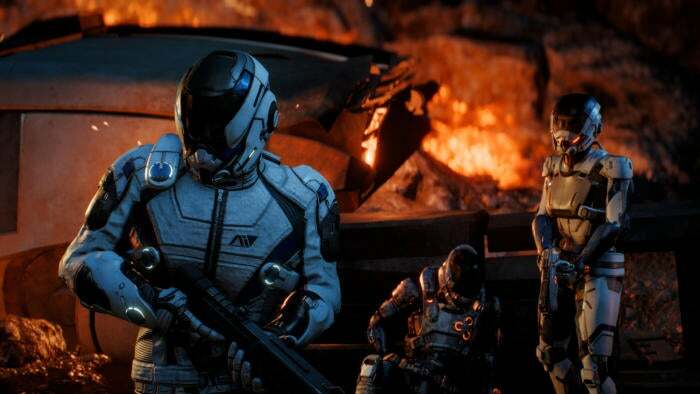 Mass Effect: Andromeda is less than a month away though, and our demo was rough. Frame rates plummeted during chaotic battles and crowded city scenes, sometimes to sub-30 per second, and got even worse when we took the Nomad for a spin. Now, a caveat: I suspect the game was running at 4K, which means some of the frame rate issues were likely exacerbated by resolution. Even a GeForce GTX 1080 would struggle to run Andromeda at a steady 60 frames per second at 4K, I imagine. Thus we’ll have to wait until our review to see whether 1080p performance is more in line with what we’d expect. There are other issues too, though. Facial animations are particularly awkward, with lots of uncanny valley moments and more than a few lip-sync problems. Can some of it be tightened up before launch? Sure. Can all of it? Doubtful. After two hours with Andromeda, I feel like I have about as many questions as I went in with—and it’s a surprising number of questions, considering we’re just a month from launch. I still don’t feel like I have a good grasp of what Andromeda is, as a whole. Yeah, it’s Mass Effect. Space opera, lots of dialogue, lots of shooting. But is it going to be good? Hard to say. I definitely have some worries, especially in a post-Inquisition world, and all I can hope is that Andromeda’s got a better idea of what matters and what’s in the way. I don’t want to see any “PSA: If you’re playing Andromeda, leave the planet Hinterlands IV” posts next month.